In the second half of 2018, Austria took over the Presidency of the Council of the European Union. 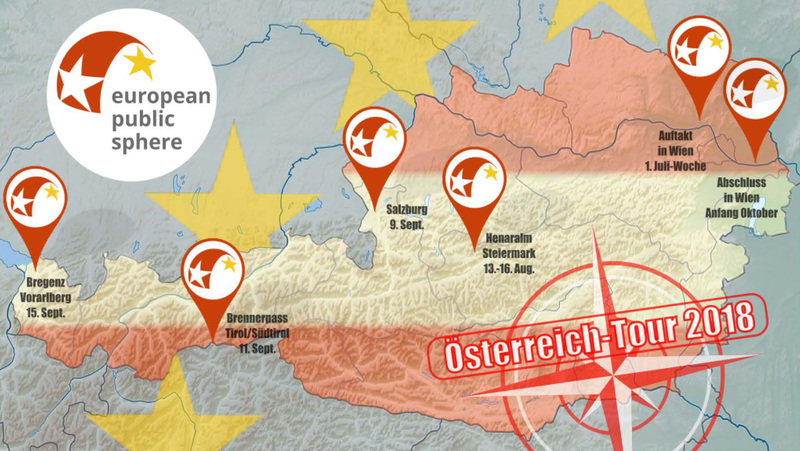 We take this as an opportunity for a series of Dome Talks from Vienna to Salzburg, from the Lake Constance quadrangle to the summits of the Alps and to the symbolic border between Italy and Austria at the Brenner Pass. 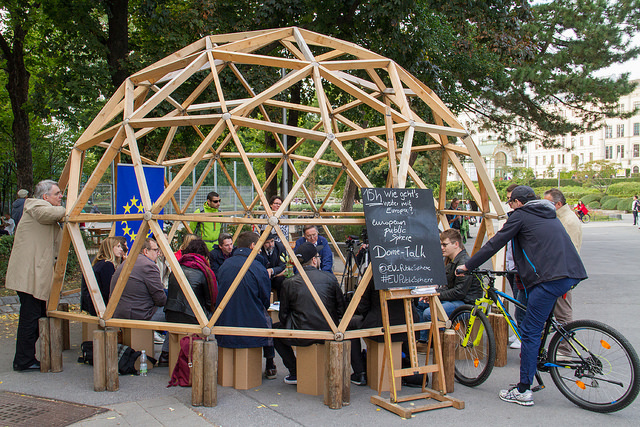 What makes the European Public Sphere so special is that it is created under a geodesic dome – transparent and open to all. With its network structure (triangles connect to pentagons and hexagons creating the space) our dome is a symbol for the necessary democratic statics and cultural diversity of Europe and a projection of the future for a solidary society in a globalised world. On its trip to the “Global Forum on Modern Direct Democracy” in Rome we meet the Omnibus for Direct Democracy from Germany as part of our Austria Tour. The meeting point is the Brenner Pass. Here we invite to joint European talks with people from Tyrol and South Tyrol under the dome, where the topic “borders” should be the focus. The question of borders and the coexistence of states in a united Europe will be posed at the spot where 100 years ago an inner-European border was drawn, which could be reopened in the European integration process and which today, in view of the flight movements caused by geopolitical developments, is again facing the question of its closure. At the respective events, one or two discussions will take place under the dome. In addition to the invited people, all citizens who spontaneously want to take a seat under the dome are also more than welcome. The exact starting times will be announced. The events will be documented and made publicly available. Gradually, a “future archive” for Europe will be created.